We are pushing 100 degrees! Anyday now Phoenix will reach triple digits and stay there until september. Yesterday I saw a guy running on the canal in Scottsdale in the middle of the day. I told him it was too hot for that, but it was the only time he could run. I choose to run after the sun sets. It was still 87 degrees, so I worked up a good sweat and got to add another 5 miles to my lifetime mileage. I am now at 603 miles since I started counting last August. I'm up to 45 miles for the month and ran today without thinking about my knee at all. I think that problem has been shelved for awhile. Now to get my mileage up a bit more and my endurance up. I ran the 5 miles today in 1 hour and 10 seconds. I need to start thinking about my next race. Probably a 5k, but maybe a 10k. 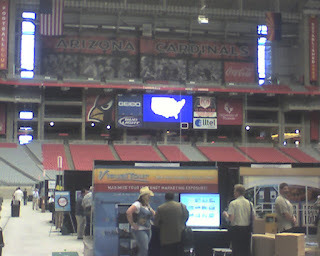 Thursday the 19th, West USA Realty had there annual convention. I've been a Realtor their going on 10 years. Amy and I went and got to see the Cardinals Dome for the first time. I wasn't all that impressed. Not very bright. It reminded me of a Costco or Sam's Club. I guess they should have named it Costco Field. They named it 'The University of Phoenix Stadium'. You may have a UoP building in your city, their popping up everywhere. But, you have to realize that it's an internet school with no football team. So, the cardinals went from a university stadium that has a university team to a stadium named after a university that doesn't have a team. Confused? If you haven't read this poem, you should. God Bless everyone that was affected by this tragedy. This is an interesting blog, too. Yes. It was the innagural Baja Fresh 3/4 mile dash. It started with a warm up of 3/4 mile walk from my home with my wife and kids to Baja Fresh. Where we dined on tacos and taquitos, chips and soda. Then as we were going to start walking back home, my son said, "I'll race ya, dad." Now my son is a couple inches taller than me, 100 pounds lighter and 16 years old. The only real exercise he gets is running to the bus stop in the morning. So, the race was on. Eventhough I just ate and I was wearing non running clothes. Thankfully, I had on an old pair of running shoes. I ran with my phone in my pocket and a soda in my hand. I was getting strange looks from everyone I passed. My son would sprint ahead and then walk. As soon as I would catch up he would sprint ahead some more. But, each time the sprinting was getting shorter and shorter. It was the rabbit and the tortoise all over again. We both reached a corner at the same time. He went left and I went right. I thought my route was shorter, but when I googled it they were equally about .21 miles from our front yard. I ran the whole 3/4 of a mile with a full stomach and dressed for work. When I reached our street I could see my son at the other corner. Whoever could sprint the final 1/10 of a mile was the winner. We both took off and I stepped on our lot maybe 2-3 steps ahead of him. Althought he said we tied, I know I won. We both laid on the driveway laughing. Hopefully, we can race again in the future, even if he wins. That gives me 11.77 miles for this week. I need to start getting my mileage over 20 miles a week. I guess the weather was a bit on the cold and windy side in Boston and Phoenix too. Amy wore a jacket while we walked about a mile and then I went out and did 5 miles in 59:58. I wanted to break an hour and I barely did. My knee felt much better. All in all, a nice run in the cool Arizona evening air. I've been doing a much better job of stretching before my run and standing in my cold pool after the run. I need to get better about stretching after too. Yes, it's Pete's birthday today. I believe he turns 66. I grew up in Cincinnati during the 70's watching the Big Red Machine. It's was a great time, as we got to watch a team with every position player good enough to make the all star team and 5 of them good enough for the Hall of Fame. They won the World Series Back to back in 75' and 76'. The leader of the team was none other than Pete Rose. Pete wasn't the greatest player of his generation, but he was the best team mate to have and the hardest working player in the game. He holds two records which tell alot about him. One, he has more hits than anyone to ever play. He has this record because he hustled and never quit. Two, he has played in more winning games than any player ever. This happened because he was on great teams and he made them better. None of us are perfect and neither is Pete Rose. 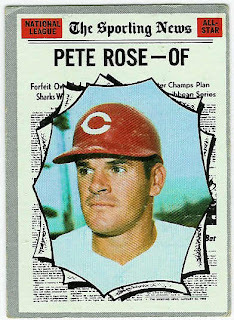 But since I like to look for the good qualities in people, Pete Rose the ballplayer is one of my favorites. On Pete's birthday I ran 5 miles in 1:01:11 for a 12:13 split. My knee felt good after the first mile or two and I enjoyed the run. Oh yes, I hustled all the way for Pete. Would have been nice if the Reds had won, but they did not. I am sorry I haven't posted much lately. There's two reasons. One. My knee has been bothering me. If I run 2-3 times in a 3-4 day time period, my knee starts hurting. It's getting better, so I am resting it. Last week I ran 15 miles over 3 days. I'm hoping I can get it calmed down so that I can get back up to the 25 miles per week I was at. Two. It's baseball season and I love baseball. 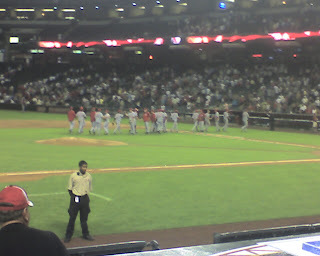 The last three nites I went to the Dbacks games against my beloved Cincinnati Reds. When I can go see the Reds, I watch them on Directv. When the Reds aren't on, I watch other teams. Right now I have the Twins-Devil Rays game on. You know you love baseball when you're watching twins/devil rays. Usually I watch Reds, Dbacks, Cardinals, national league and then american league. In that order. Below is a picture of the Reds celebrating a win over the Dbacks. The Dbacks took the first two games in the series. So, due to the lack of running updates and the lack of time from baseball I haven't had much to write about. Tonight I was planning to run. But, it is extremely windy. If the wind dies down, I'm runnin'. Our pastor on Sunday told us of a mountain in the French Alps that has an inn half way up called "The Mediocre Inn". Mountain climbers stop their for a rest on the way to the summit. Mediocre in this instance means the halfway point. He then told us that 80% of the hikers turn around after resting at the Mediocre Inn. I fell asleep at this point, but my wife told me that he then went on to say that far too many people settle for mediocre, instead of reaching their goals. I think it's something good to think about when I'm out running. Don't settle for mediocre. Run past the mediocre inn and reach your goals. That, and get more rest so I don't miss out on good sermons. p.s. I haven't blogged for awhile, so I'm making up for it with three today. I do like running after the sun goes down. Even if it's 80 degrees. After I stretched, I ran my neighborhood route. I could feel my knee. Slight discomfort. Nothing that would make me stop doing an activity, but enough to make me wonder if I was doing damage and if it would get progressively worse. But after about 2 miles the pain went away and I was running sub 12 minute miles. I was listening to my Ipod, running against traffic and being very aware of cars when I heard the roar of an engine. I turned around to spot the car and didn't see anything. I thought that it might have been part of the music so I listened, then turned around again. No car. Finally, I looked up and saw a Cessna or some other small plane overhead. We have a small airport and the planes circle over our neighborhood to land on the only runway. Isn't it great that Baseball is back? I have Directv's baseball package and I've seen all or part of about a dozen games already. The Dbacks just lost a tough one. I taped the end of the Mets/Cards game, in which the Mets were winning. I can now watch it as I cool down from my run. Oh yeah, my run was 5 miles in an hour and 2 minutes. If my knee feels fine tomorrow I'll do another 5 miler in the evening. Hope your running is going well. Mom and Dad out for a visit. My life gets completely turned upside down when we have relatives visit. My office at home is the guest bedroom, so I end up working all over the house and I don't get as much work done. My folks were in town from last Wednesday until this morning. It's great to see them. They are in their 70's with some health issues. So, the routine is they get out here and we sit around the house for a week. They're not up to going sight seeing or even to a restaurant. So, no spring training, no hiking, no zoo, no restaurants, no movies, no malls, no mountians, no museums. You get the picture. But, we had a great time. Amy did take my mom to play bingo at the Gila River Casino which they both enjoyed. I think bingo is the devils game, so I stayed home with dad. Luckily, we got to see Ohio State beat Georgetown and lose to Florida in the Championship. Not exactly the outcome we wanted, but it was fun to watch on TV. We got to see the Suns beat up on the Dallas Mavericks, we got to see the Diamondbacks beat the Rockies and we got to see our beloved Cincinnati Reds win on opening day against the Chicago Cubs. We had some great home cooking. My dad, mom and Amy all took turns cooking. My dad taught my daughter how to make his special cheesecake. It was awesome. All in all, it was a great visit. I took them to the airport this morning. Not sure if or when they'll get to come out to Arizona again. I think they would be just as happy if we made the trip to Ohio to visit. Which we will in July. So, today April 3rd, 2007 is the start of my 2007 Summer Training Program. A five month program to get my weight under 200 pounds, my 5k time under 29 minutes and to prepare for when the temps start to fall again. The last two weeks have been for rest and renewal. I needed to get over the aches and pains that have built up. I tried running, but could only make it about 20 yards with pain in my left knee every time I came down on that side. I ended up walking twice for about 2 to 2.5 miles each time. On Saturday, March 31st I went for a run around 11 am. It was a beautiful day, the temps were pushing 80, so I'll have to start running at night or early in the morning until the weather breaks (read October). I started running and noticed that my left knee did not hurt and the run felt good. I ran for about a mile and then took a walking break. I did ran/walked for a total of 4.14 miles and only stopped because I didn't want to over do it. And my wife was unloading the groceries from the car with my 73 year old mother. It would have looked bad if I would have waved to them and kept on running. I helped them unload and was very happy with the run. Sunday,Monday and Today I had no pain and I am looking forward to running tonight. Strenghten my running muscles, so that I don't have any more knee problems. Get my mileage up to 25-30 miles per week. Watch my diet. Eat more veggies and fruits. Lose 6 pounds a month.